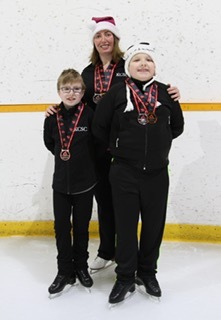 The King City Skating Club is very proud of their Special Olympic skaters. At the area regional competition the skaters obtained the following results. Chelsea Ricci-Martire in Level 2 Ladies FreeSkate placed 8th, Level 1 Solo Dance placed 2nd, and Introductory Interpretive placed 1st; Sean McRae in Level 2 Men’s FreeSkate placed 3rd; and Peter Borland in Level 2 Men’s FreeSkate placed 1st, and Level 2 Men’s Introductory Solo Dance 2nd. The club is especially proud of Peter who has been chosen to go to Sault St. Marie and represent the club at the Provincial Games Feb 1 and 2. We will Peter all the best at Provincials. What an exciting year for our Special Olympians!